This Fan Page has links to photographs of Pete "El Conde" Rodriguez. 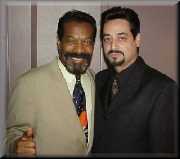 "El Conde" passed away in bed in his home in the Bronx New York on Saturday December 2, 2000. Que viva la Salsa. These photographs were taken by Elvira Dominguez and Juan Fernando Lamadrid. All rights reserved and copyright www.justsalsa.com. Your feedback is welcome. "Click" on Thumbnails Below to Enlarge.